Please note: in the above picture on the right, for size comparison; left is 45-110 Sharps, right is Winchester 30-30. 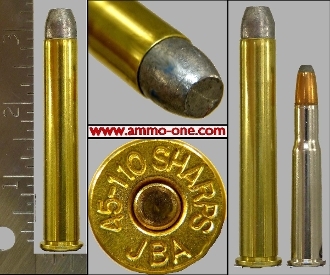 One Cartridge not a Box: .45-110 Sharps Straight, 2 & 7/8", custom loaded using then new, (now Obsolete) Jamison Brass cases with "45-110 SHARPS JBA" Head-Stamp and loaded with 405 grain lead projectiles. History of the 45-110 Sharps, 3&7/8" Straight cartridge: The 45-120 Sharps cartridge was introduced around 1896 by the Sharps Rifle Company for the Sharps-Borchardt rifles in 4 verisions the 45- 90 Sharps Straight, the 45- 100 Sharps Straight, the 45- 110 Sharps Straight and the 45- Sharps Special.